Another lovely day today, too good not to have a barbecue. After a hard day of lying around in the park, reading, sunbathing and generally not doing very much too energetic, we lit the barbecue and cooked some lovely ribeye steaks. We also cooked some mushrooms on the barbecue, topped with garlic and parsley butter. The steaks turned out well – slightly overdone but still pink in the middle and juicy, tender and tasty. A few weeks ago, we bought some Halen Môn smoked sea salt and haven’t used it for anything yet, so we used it to season the steaks after cooking them – the salty, smokey taste worked well and complemented the barbecue taste. We are sticking to our “let’s barbecue as often as possible this summer” plan rather well so far and the weather has been quite cooperative, which helps! Subscribe to comments with RSS	or TrackBack to 'Barbecued Steak'. I can’t believe this weather we’re having – it’s amazing! Bbqs are definitely the way forward. As this summer progresses I am just getting more and more jealous of your BBQ! I like your motto for the summer. BBQs are just the best. I am jealous of the BBQ and the outside space. I sometimes hate my top floor flat! Grilled ribeyes are the best! I also like your grilled mushrooms. 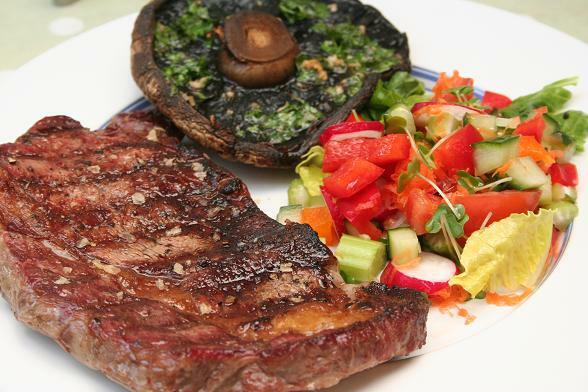 Have you tried chimichurri sauce with your steaks? We spent one miserable summer in a flat without a garden, watching our neighbours barbecue almost every day. It was so painful which is why we’re making up for it now! We haven’t tried chimichurri sauce, Nate, but I do have a recipe I’ve been meaning to try out for a while. I’ll hunt it out!